Acta linguistica Petropolitana is an open publication and welcomes papers that conform to academic publication requirements irrespective of the authors’ place of study/work or residence. Papers in Russian, English, French or German are accepted for publication. All papers proposed for publication undergo double blind expert assessment. The reviewers are appointed by the Editorial Board. In order to avoid any conflict of interest the reviewers should be independent from authors (i. e. they should not be affiliated with the same institution as the author or have published papers in collaboration with the author during the last five years). All authors receive an expert review or substantiated refusal. The Editorial Board is committed to observing all accepted ethical standards for scientific publications and safeguards against any misuse of office by the Editorial Board members or staff. 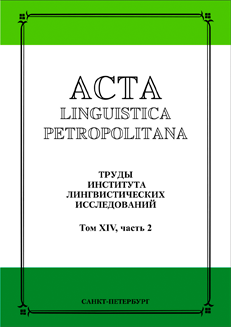 Acta linguistica Petropolitana is a fully non-commercial project. The authors are not charged for the publication or pre-print preparation of their papers.